Look at this gorgeous nail polish! No nail art, because this is fabulous by itself. Black with red shimmer. Genius. I wish I had put a matte top coat on it before I took it off, but I wasn't thinking. Anyways, isn't it great? This looks great on you! I love my little bottle of Lubu Heels too! this is great.. i like this nail polish so much. this nail polish looks so smooth on you. gorgeous!! I gave you the Laine award!! 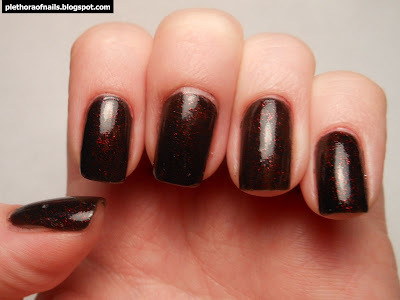 Black with red shimmer IS genius! I bet it would have looked amazing matte! I need to get this one! Gorgeous! I've got a blog award for you. Check out my blog than you can take your award from there.